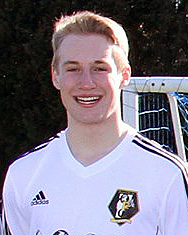 To celebrate Declan’s zest for life, Queen City FC will be providing a $500 scholarship to a graduating player whom exemplifies the characteristics that he lived by everyday. It is our hope that through this Memorial Scholarship, Declan can continue to make a difference in the lives of many. We will always remember his love, laughter and incredible spirit. Provide verification of enrollment at the start of the first semester in a two or four-year college or university. All applications will be reviewed by the Queen City FC Board of Directors and the recipient will be selected on or around June 4th, 2019.